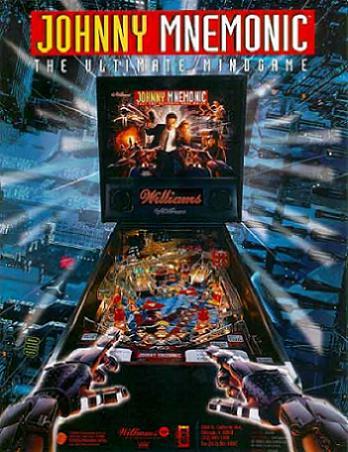 Johnny Mnemonic is a 1995 pinball machine based off the movie of the same name, created by George Gomez and Williams Electronics, with artwork by John Youssi. The pinball follows the plot of the movie fairly well; you must accomplish various tasks, such as finding a cure for NAS, getting rid of the Yakuza, and getting various rewards from the Matrix. Perhaps the most interesting thing about the game is its main toy - a magnetic glove that captures balls and must be steered over to the Matrix in order to drop the ball and get a reward. The game is generally held in higher regard than the movie it's based on, with its nice art and gameplay, though it is infamous for being very lax with the scoring, with scores sometimes reaching in the hundreds of billions. "Awesome McCool" Name: Captain Courageous. Call a Hit Point a "Smeerp": The player can earn "gigabytes" as well as points. The Cape/Captain Superhero: Captain Courageous, of course. Computer Voice: One serves as the announcer. Cool Shades: Worn by the cow when you get the final Crazy Bob item. Easter Egg: Playing a game when the clock hits 12:00am starts Midnight Madness. The game falls dead, draining the current ball, then starts a four-ball multiball frenzy where every target is worth 3 million points. Eat the Bomb: One animation shows Captain Courageous doing this. His head expands for a bit after it explodes, but otherwise he's unharmed. During Midnight Madness, every shot shows a Written Sound Effect. "Moo!" is among them. Also, wait long enough during Attract Mode and then press either one of the flipper buttons or the launch button. At random occasions you may hear a "Moo!". The final Crazy Bob item is 900 million points, along with a cow with Cool Shades showing up on the DMD. Grappling-Hook Pistol: One animation shows a man using one of these to hook onto something. Golden Snitch: Spinner Millions, which is worth 10 million points a spin for the rest of the ball it's activated (on default operator settings, you can only get this once per game). With only about 5-6 trips through the spinner, this can reach a billion points or more. The fact that it's part of your bonus that can be multiplied up to 4X will turn that into 4 billion. There is also a Good Bad Bug with Hold Bonus which will essentially award it twice on the next ball, meaning having Hold Bonus would award you another 8 billion on the next ball, and again as long as you keep getting Hold Bonus. By comparison, the Wizard Mode usually awards about 5 billion points. note As somewhat of a Self-Imposed Challenge, Some machines will weight one end of the spinner, or replace it with a gate that will only register one "spin" in order to make it less lucrative and balance the scoring in the game. Match Sequence: A very simple one. Monumental Damage: One animation during "Yakuza Strike" shows a man firing a rocket launcher at the Golden Gate bridge, destroying it. Mythology Gag: Shooting the outer loops several times in a row prompts Skull to appear and shout "Again!" Rudy shouts "FRENZY!" at the start of Frenzy. Pinball Scoring: Exaggerated, like Attack from Mars One of the keys to scoring is Spinner Millions, which will give you 10 million points in bonus for each spin of the spinner (For about 150-200 million each trip through it). On a good ball this can amount to billions of points. The bonus multiplier applies to this, so you can multiply your Spinner Millions total up to 4x. And by getting Hold Bonus, you are awarded your bonus from the previous ball not just once, but twice due to a good bad bug. There is also the Power Down Wizard Mode which typically awards several billion points. The software will happily display scores in the hundred billions. The Cap is 999,999,999,990 points. Sapient Cetaceans: James, the cyborg-enhanced dolphin, appears next to the left ramp. Shout-Out: Getting the top Power Down score shows an animation of the MCP Cone spinning and saying "You are the master of Power Down" in Steve Ritchie's enhanced voice. Starting Frenzy uses the same sound clip as in Fun House. Skill Shot: The middle lane will be flashing; the flippers move the flashing light left and right. If the ball goes through the correct lane, you score 25 million points, multiplied by the number of Skill Shots made, as well as 5 gigabytes. Slow Electricity: "Power Down", which starts with all of the sections lit initially, then shuts them down one by one over time. Spelling Bonus: The left loop spots a letter in "J-O-H-N-N-Y", and the right one does likewise for "M-N-E-M-O-N-I-C". Getting all the letters starts a frenzy - every switch is worth 15 million points for 20 seconds. Technology Marches On: The last player to accumulate 320 gigabytes is immortalized as the Cyberpunk. Timed Mission: Most of the modes, include the video one. Tricked Out Glove: The magnetic glove, which captures balls to activate a Matrix Award. Video Mode: A Matrix Award. You must use all four buttons to move your square (a "predator") around the display and catch all the dots ("prey") before time runs out. Wizard Mode: "Power Down", which typically awards several billion points. The white triangles are lit and all four pinballs are put into play. You get 400 million points for each triangle, but they get systematically shut down one-by-one as time passes. Written Sound Effect: These show up whenever you make a shot in Midnight Madness. Yakuza: They feature prominently here, just like the movie, and have their own mode - "Yakuza Strike". J-Bone: "Don't be a zombie — play pinball!"